Here's a look at what might have been. 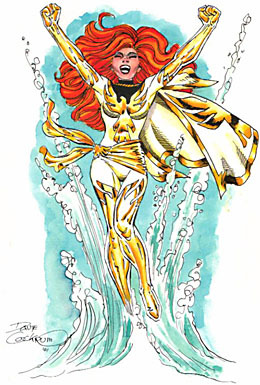 When Dave Cockrum was designing Phoenix, he wanted her costume to be white, not the green it eventually became. This idea was shot down because, due to the crappy paper and printing processes used back then, you would have been able to read the next page through her body. 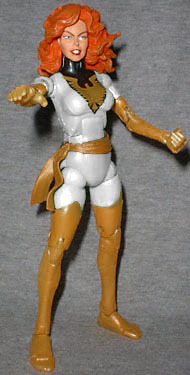 The white costume did finally make its appearance, as the pure and true Phoenix, in the recent X-Men: Phoenix - Endsong limited series. It was a great little easter egg for fans who knew the behind-the-scenes stuff, and it's still a cool design. It was hard enough getting either of the Phoenix figures in ML6, so adding a third version would have just made fans' heads explode. However, if you've sold your soul to the devil and end up with an extra, a quick coat of white paint will make an easy custom. If you want to go over the yellow with gold, that works, too. Phoenix: leave her dead or bring her back? Tell us on our message board, the Loafing Lounge.